Fascism by 1934 was marching triumphantly. In Italy, Mussolini had long consolidated his power and was preparing to attack Abyssinia. Hitler, after one year of power, was tightening his hold on Germany and preparing the first of the many international adventures which were to lead to the pyre at his Berlin bunker. In England, Mosley had returned from a long visit to Germany and reorganised and re-trained his blackshirted British Union of Fascists. At that time there seemed nothing to stop Mosley's<fn> libcom note: fascist leader Oswald Mosley </fn> military marching columns and aggressive propaganda. The Labour Party advised, “Be constitutional. leave it to the police and don't forget to vote Labour!” The Communist Party, as each big Fascist meeting was announced, called for a “counter- demonstration” and advertised, free of charge, Mosley's gatherings.1 This ensured a big crowd at any blackshirt meeting, just to hear the row, but of course it never stopped the meetings themselves. Indeed, after his return from Germany, Mosley appeared to welcome and seek out this kind of “counter-demonstration”. This successful action had been applied by Goebbels in the fairly early years of the Nazi party. In South Northumberland and Durham the BUF began a rapid growth. It was well organised, with many ex-army officers in command, plenty of full-time workers and no shortage of money. They began making recruits in the industrial and mining areas, including many from the CP. 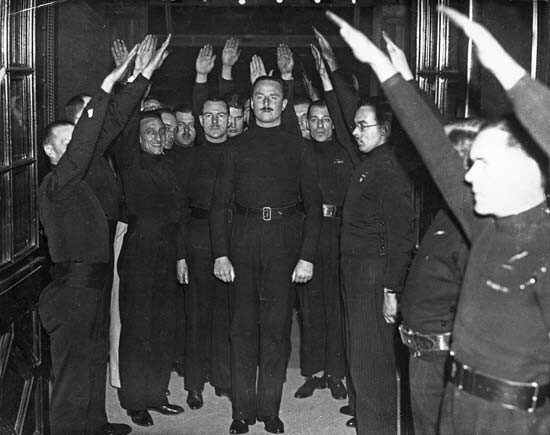 The Blackshirts grew bold as their military-style parades grew. Then, on May 1 1934 the ILP<fn> libcom note: Independent Labour Party </fn> were holding a May Day meeting outside the Gateshead (Co, Durham) Labour Exchange. It was 3 o'clock when the meeting began and most men having already signed on, the queue was small when a sound of singing, which only a few identified as the Italian Fascist song, was heard. A column of Blackshirt troops marched across the trodden turf of the Windmill Hills towards the ILP meeting, chanting 'M-O-S-L-E-Y'. A pause and the dole queue broke in an angry charge against the Fascists.2 At the first sharp clash the column broke and scattered, some escaping, others pleading for mercy. It was all over in a few minutes and police reinforcements found only an alternative meeting, a re-formed queue and same unemployed men who looked a bit pinker than usual. The next move was a big Fascist rally in Gateshead Town Hall, with more coaches bringing the troops from all over Durham and north of the Tyne. Mosley was to speak, but in fact was sick on the date, although the rally was held. The coaches arrived to head a short march, heavily guarded by police, past the police station into the Town Hall. By this time the column had reached the lock-up, singing Mussolini's favourite ditty. It looked like a spontaneous charge this time. The silent onlookers were hemmed on to the pavements, from kerb to kerb the road was occupied by Blackshirts and police. If only someone started, others might follow that was the thought in many minds. Suddenly the column wavered in two places, a short rumpus and Tom Brown 3 was dragged by the neck into the very convenient police station. A few yards away two youths, 17 and 18 who - they said - had gone to help Brown, were arrested. They were held until the rally had ended and the Fascists were safely on their way. Next day the youths were bound over and Brown was remanded. The hearing, a few days later, lasted for two hours and was reported in most of the national dailies. Brown had been charged with assault and the rest by the police, and with assault [on] the BUF. The first police witness told the usual story - Brown had refused to make a written confession, but had made an oral (he called it verbal) confession. In fact, Brown had refused to speak in the station, except to give his name and address. But worse was to follow. A steel shaft with a big, round flange with a sharp edge was produced in court by the police. It was deadly enough to fell a steer. 'That's a fine thing to hit anyone with,” Brown at once stuck his hands deep in his pockets. The Blackshirt who signed the charge, standing in the witness box in full Fascist uniform and giving as his address the BUF “barracks”, said he had been struck but, and this was to his credit, certainly not by the deadly weapon displayed. Indeed he said he received no injury. The police cross-examiner looked disappointed, but the witness stuck to his defence. The police witnesses under examination contradicted one another, the prosecution was in the place of the cook who got too many eggs in the pudding and their case became hopeless. It was dismissed “owing to conflict of evidence”. As a result of these events and the increasing threat of the Fascist para-military organisations, a meeting was held and a temporary and special purpose organisation, the Anti-Fascist League, formed. From the start the League became the most, indeed the only successful organisation in Newcastle and district, though limited mainly to open-air meetings. About 150 men and women joined, but the League was actively supported by large crowds. Most of the members were unemployed, for the time was the great slump, the place one of England's depressed areas. Jarrow, the “town that was murdered” was Gateshead's neighbour.4Subs were threepence a week (old currency) and everybody paid and collections at street meetings helped, though many were living near the starvation line. Premises were secured near the old city wall of Newcastle, at a spot which had endured Scottish sieges, the hall of the old Smiths' Guild. Above the arched door were the carved stone arms of the Guild, a shield bearing the motto “By hammer and hand do all things stand”. The hall stood in a quadrangle and here the League held physical training. The people who lived about were a close-knit little community, many of them street traders and at first were aloof and suspicious, but soon warmed and adopted the League. As to political parties and such, however, the League stood alone. The Labour Party, apart from two organisers from the T&GWU and one woman Labour councillor, would not associate. Echoing the official advice they said, “Leave it to the police and vote Labour”. But the League went on. The Blackshirts, beaten in propaganda were to be beaten in combat too. They were quickly driven from the working-class quarters. Almost at once the BUF were driven on the defensive. In a few months their aggressiveness had vanished and they were being pushed - hard. On one occasion, after a big Fascist rally, the Blackshirts were besieged in their headquarters in the business centre of Newcastle. For hours the police moved on a crowd that always came back. Late at night groups of Fascists slipped out, after the crowd had thinned, only to discover that the anti-Fascists were not only in front of the building. That summer, Mosley had planned a big rally on the Town Moor on “Race Sunday”, the Tyneside's annual holiday. It was presumed that the League would hold a not-very-dignified counter-demonstration. Mosley wrote to the Home Secretary offering to call off the rally if the Home Office thought it wise to do so. The official reply passed the ball back, as did the Newcastle police. Then Mosley, without the official excuse he had hoped for, himself cancelled the rally. The BUF began to lose members. Information of counter-attacks reached the League, but they never reached fruition. One plan was a night raid on the Smiths' Guildhall. The locals volunteered to barricade the old narrow streets with carts and barrows, while a League guard kept watch, but the Fascists were to be allowed to enter the Guild first. The carts and timber were not to keep them out, but to keep them in. When it came to “belling the cat”, however, Blackshirt heroes were few and according to the regular and corroborated information received by the League, the raid was called off because of lack of spirit. The BUF on Tyneside dwindled rapidly. In a matter of six months, most of the members had left - few, if any, public appearances were made and the small number remaining were little other than a club, and so it remained for years. The Anti-Fascist League, poor and “un-influential” had, by its devotion and courage, proved that Fascism can be fought and defeated. 1. For the opposite point of view, see Joe Jacobs “Out of the Ghetto”. Joe Jacobs broke from the CP but remained committed to Stalinism and his advocacy of these tactics he passed to libertarian circles. 2. Lest anyone is over-critical of workers today, it is fair to say this was only a few years after the formation of the Imperial Fascist League as a strike-breaking force, and the use of upper and upper-middle class fascist scabs in the General Strike was fresh in the memory and Mosley hadn't had the chance to go from naked fascism to the craftier populist approach of Hitler. 3. Tom Brown, who wrote this piece, passed from the old Socialist Labour Party through the CP as a Syndicalist, and finally became an Anarcho-Syndicalist. 4. Jarrow was notorious in the Thirties as the shipbuilding “town that was murdered” with all its occupants made unemployed in the Great Depression. Today, in what is referred to as a minor recession, almost the whole Northeast is in that situation, not to mention elsewhere. 5. Hannen Swaffer, from being so trenchant a dramatic critic many theatres banned him from entering, became the Labour Party's standard-bearer in Fleet Street and claimed to be the first anti-Nazi journalist In the UK. After Labour's 1945 election victory he declined a peerage on principle but asked for restrictions on Spiritualism (his other interest) to be lifted as a reward for his services to socialism. To do so, the Government had finally to abolish the medieval Witchcraft Act! 6. As the CP needed fascism as an ideological excuse to justify its international policy, it advertised fascism while boasting of its anti-fascism but described people who would abolish it prematurely as “gangsters” or “adventurers”. In a similar way they called Socialist-led labour movements “social-fascist” but anarcho-syndicalist unions “criminal”, “irresponsible” or “adventurist”. 7. “The traditional Hebrew policy” refers to the Anglo-Jewish Establishment's policy of entering the mainstream establishment. The Chief Rabbi of the British Empire for instance, is an office created by the Crown. The “43 group” did not measure up to assumptions. It started as an under-cover CP front attracting many ex-CPers and others, not only Jews, especially in the armed Forces with fascist officers. After the war, Zionists, CPers and finally Special Branch used it until it disappeared though its ideological survivors were the Anti-Nazi League and the still extant Searchlight.